You have heard me ramble on before about how I do not really like baby carrots. And I don't - they taste funny and they are wet. And they appear to last way too long in the refrigerator. Basically, they creep me out. 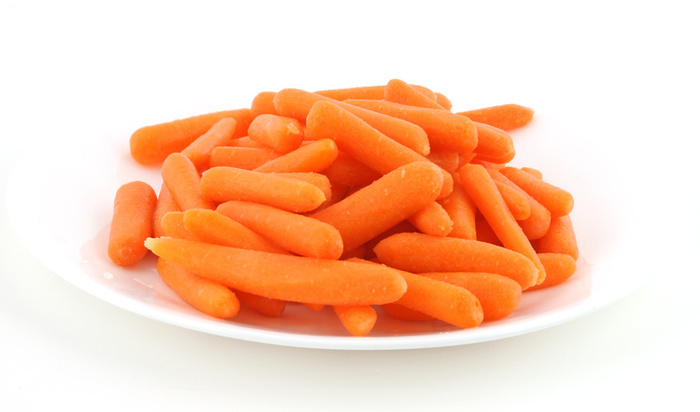 So this week, I am eating baby carrots and I am miserable. I want celery, peppers, apples, pears, grapes, clementines. But baby carrots it is - my budget allows me pretty much one 'snack' fruit or veggie a week. I decided, out of sheer boredom, to figure out exactly what a baby carrot is, why it is slimy and why they seem to last forever. Now, I am not going to give you a bunch of links (okay, well, here is one) - I literally typed the questions into my google search bar and read the first few relevant web pages that came up...this is not a scientific research page people...just a blog by a chick that doesn't like baby carrots but eats them anyway. What are baby carrots? Baby carrots are made from big carrots that look too funny to sell in the grocery store, so they make them into baby carrots...or, as I found out, 'baby-cut carrots.' No shocker there - onto the more intriguing stuff. Why the heck are my carrots always wet and slimy? Okay, this surprised me a little. This is because the manufacturers add water to the bags of baby-cut carrots because...wait for it...people actually prefer their carrots wet. Okay - eeww. And if I am offending the wet carrot lovers of the world, sorry. But really, eewww. I think I am officially over bad tasting, slimy, wet bleach carrots forever (as soon as I finish my current bag).